Building God’s Kingdom, One Child at a Time! We consider it an honor to spend time with your children. 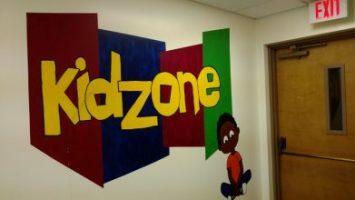 Our second floor, the “KIDZONE”, is devoted to helping them grow. For safety & security each family fills out a JFC Children’s Ministry Information Sheet. Please take a moment to fill it out online. Thank you! meet with the same teacher each week, allowing great relationships to be built. kids are excused to attend classes with a message geared to their age level. K’s and younger have classes that run the entire length of the service. They have their own time of worship and learning. We have great teams of teachers and assistants who share the responsibility of teaching your children. Meets the first Sunday of each month. during the entire main worship service (bothat 9:00 and 11:00). 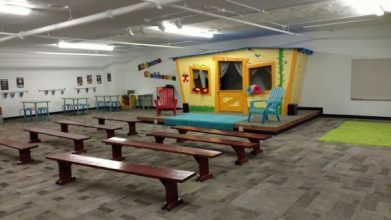 The Kid’s Clubhouse (room # 200) is open 6:45 – 7:45 PM! This is an active and fun night. We play in the gym, make crafts, sing and learn how to walk with Jesus every day. There are video and board games for fun afterwards. This is a great night to invite your friends. Preschool children have their own fun across the hall in Room 202, in the Preschool wing. We meet in the Kids’ Clubhouse (Room 200) on Wednesdays from 6:30-6:45. The Junior Puppet Team meets from 7:45 – 8:15 on Wednesday evenings in the Puppet room. We have lots of special events throughout the year! Our Spring Fling is a great day celebrating Easter and includes an Easter Egg Hunt. 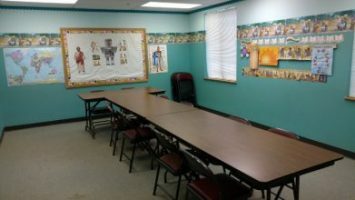 Vacation Bible School runs in the summer. Camp Gideon offers a week of Day camp and we typically run a shuttle for this great week. Other special events are our summer outings, one-day camps, Missions Festival…watch for details! April 20th 2019 10-12. A Spring Fling that is accessible for child of every level of physical and cognitive ability. Please sign up if your family needs a sensory-friendly experience that is accessible to those with children of every level of physical and cognitive ability. We ask you also sign up if you have food allergies. 3 ways to hunt eggs so everyone can participate! Please contact Lea if your child has special needs. We want this to be a day that is fun for everyone!!! In our Kid’s Clubhouse on the second floor we have a library with great books for Elementary aged readers. Check out this list of books (link) or just stop by to pick out a book!